You are in England , York to be specific. You are a photo-journalist working for a major newspaper, and you're caught in the middle of this epic disaster. The situation is nearly hopeless. You're trying to shoot career-making photos. There are houses and people swirling around you, some disappearing into the water. Suddenly, you see a man in the water. He is fighting for his life, trying not to be taken down with the debris. You move closer... Somehow, the man looks familiar... You suddenly realize who it is... 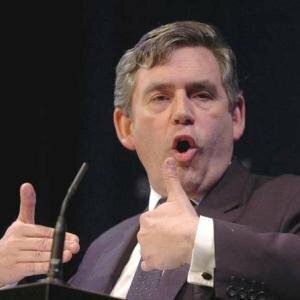 It's Gordon Brown! You can save the life of Gordon Brown or you can shoot a dramatic Pulitzer Prize winning photo, documenting the death of one of the country's most powerful men!